Nannies of Brentwood provided child care!Awesome. This is an awesome hotel with everything in the hotel to keep the family busy. Nannies of Brentwood~Green Hills~Nashville~Franklin provided childcare in our room and we had the best sitter. Call Nannies of Brentwood~Green Hills~Nashville~Franklin ahead of time to book a sitter. They do accept last minute requests but always better to plan ahead. This resort is amazing for families and adults. Thier "ICE" show in the winter months is a spectacle to see and enjoy. They have shows with choirs and fun shows and characters for the kids. The Christmas decor is stunning all throughout the atrium areas. There is shopping and restaurants that will attract all. The rooms are elegant and clean. We had a room overlooking the atrium with a balcony. 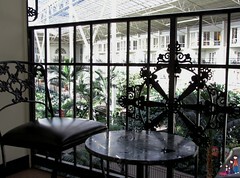 We had coffee overlooking the lush and tropical gardens, watefalls, and coy ponds of the atrium area. You need to stay here at least once in your life. Research seasonal activites before booking to see what would fit your family best. Also, there is Opryland close by to possibly take in a show. They have a stable for horse riding during summer months. But anytime you take a family to this resort is a good time. They have activites year round. The room was beautiful with a view of the Atrium. The massive gardens spread all throughout this resort are amazing. They have an ICE show at the Gaylord that is fun for everyone. The decor in this place is over the top cool. The onsite restaurants offer a variety of flavorful foods. You will feel like a star when you stay at the Gaylord Opryland. This is a kid friendly resort. There is all kinds of things for kids to do. You can take them horse back riding, play at the pool, ride in the boat through the atrium, and playing at the ICE show. Kids will love this place. i loved this hotel and didnt want to leave. This hotel felt like we were staying in a city with a canal and fountain light shows. I stayed for 4 days and still didn't have time to see all the hotel. 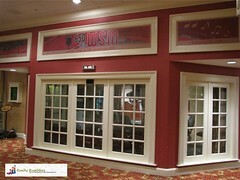 It is walking distance to Opry mills mall and Opry Land. They have a shuttle that will take you to the mall and opryland. Don't try to order pizza delivery because they are not allowed on the hotel property. Kids are begging to go back! The hotel is dreamlike...perfect temperature, beautiful landscaping all around, and a wide selection of things to enjoy. Our kids enjoyed the outdoor pool the most - they had a host that conducted karaoke & limbo contests, games, etc. Great to entertain the kiddos while mom & dad relaxed. In the evening, we went on a riverboat ride (inside the hotel! Amazing :). After that it was off the ice cream shop before parking ourselves in front of the lighted fountain that was synchronized to music. Our kids were squealing with delight! Our visit also including a trip to the arcade and several yummy (though pricey) meals at various eateries. All without ever leaving the hotel. Perfect! Next trip, the only thing we will change is that we will definitely stay in an atrium view room for a balcony overlooking the lush greenery & beautiful interior of this magnificent hotel. Our next trip is already booked! The Gaylord Opryland is immense. It's easy to get lost, so be sure to pick up a map! Plenty of restaurants are here so you'll find something for everyone. The gardens are incredible and kids will love that a river- with boat rides- flows through the Delta area. With the partnership of Gaylord hotels and DreamWorks there are loads of kids friendly activities throughout the year. Visit from mid-November thru the end of December for ICE. Tons of ice sculptures tell a DreamWorks tale and characters are on hand for photos! If business or pleasure ever takes you and your family to Nashville, the Gaylord Opryland is definitely where you should stay. The resort includes waterfalls, rivers, restaurants, bars, and shops all under a glass roof, and it's simply amazing. Through their new partnership with Dreamworks, they frequently offer special promotions where kids can see the popular characters. Upgrade to a room with a balcony if your kids are old enough. The interior-facing balconies are so unique and fun. Beautiful place to visit and fun for the kids too. Large hotel that goes forever with winding river stream, multiple eating places and walking space. AT Christmas the decorations are fabulous, lights everywhere and great enviroment. You can walk across to the Opry Mills Mall to shop...plenty to do. *Go outside and get some fresh air! *Catch the light shows in the lobby.